Tarzan and the Foreign Legion is a novel by American writer Edgar Rice Burroughs, the twenty-second in his series of books about the title character Tarzan. The book, written June–September 1944 while Burroughs was living in Honolulu and published in 1947, was the last new work by Burroughs to be published during his life (Llana of Gathol, the tenth book in the Barsoom series, was published in 1948, but it was a collection of four stories originally published in Amazing Stories in 1941). The novel is set during World War II. The term "foreign legion" does not refer to the French Foreign Legion, but is the name given in the book to a small international force (including Tarzan) fighting the Japanese. 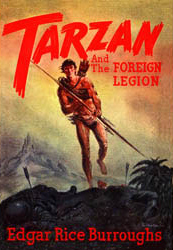 The book was offered to Argosy magazine, in 1945, for serial publication, as per every Tarzan story previously, but the story was rejected by them and returned. Burroughs published it himself, almost two years later. While serving in the R.A.F. under his civilian name of John Clayton, Tarzan is shot down over the island of Sumatra in the Japanese-occupied Dutch East Indies. He uses his jungle survival skills to save his comrades in arms, and they fight the Japanese while seeking escape from enemy territory. Tarzan also reveals to his companions how in his youth, after saving the life of a witch doctor, he was rewarded by treatment that gave him perpetual youth. His companions ask if he is also immortal and he says no. According to Tarzan Alive, Philip José Farmer's study of the ape man's life and career, the incident related occurred in January 1912. The book has been adapted into comic form by Gold Key Comics in Tarzan nos. 192–193, dated June and July 1970. ^ Chalker, Jack L.; Mark Owings (1998). The Science-Fantasy Publishers: A Bibliographic History, 1923-1998. Westminster, MD and Baltimore: Mirage Press, Ltd. p. 128. ^ Burroughs, Edgar Rice. Tarzan and the Foreign Legion, Edgar Rice Burroughs, Inc., 1947. Chapter 25. ^ Farmer, Philip José. Tarzan Alive: A Definitive Biography of Lord Greystoke. Doubleday, 1972.